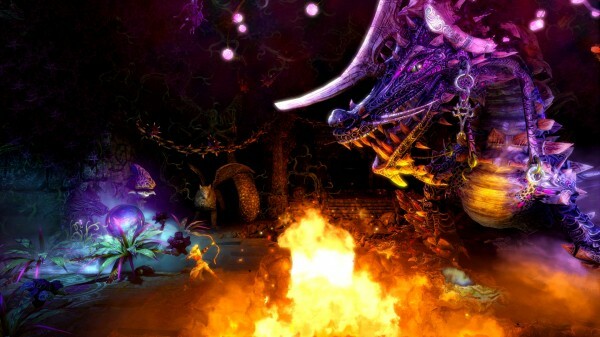 Trine 2 makes a visit on the XBLA platform, building up on its predecessor Trine, and bringing with it the wonderful gameplay and gorgeous visuals. The game is available for $14.99 (1200 MS) on the marketplace and is an action adventure & puzzle platformer developed by Frozenbyte, Inc. The story takes place in a magical kingdom, and with it the game shares the story of the unity of 3 characters: a wizard named Amadeus, a knight named Pontius and finally Zoya the thief. These fascinating characters are brought together by the mysterious Trine believed to be an artifact of souls. It alerts them to dangers within the kingdom and they unite to rid the world of trouble. To start off, the game world is brilliantly designed with lush visuals and vibrant colours. The levels have great contrasts going from bright & happy and all the way down to stormy & depressing. 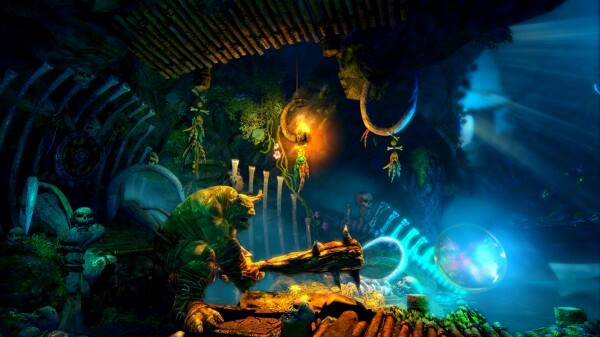 Every little detail is taken care of and Trine 2 is by far one of the best looking games on the XBLA marketplace. Moving onto the gameplay, each of the 3 characters have their own special abilities. As Amadeus, you can manipulate objects in the environment and conjure objects out of thin air using your magic. As Pontius, you are brutally armed with armour and a nice mixture of hack & smash weapons. And last but not least, Zoya is equipped with a lightweight bow and grappling hook that you can use to get around swiftly and silently. 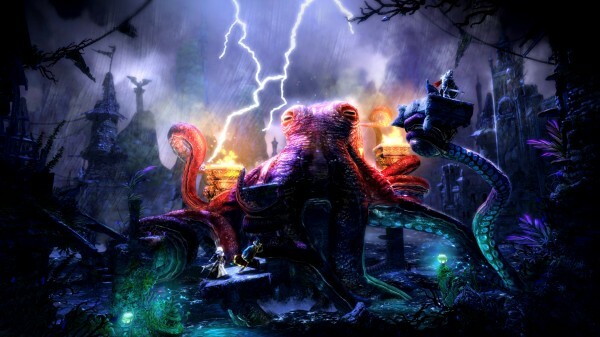 Each of the characters can be used to traverse through levels in a different way and this is where Trine 2 truly shines. In the SP portion of the game, you can take control of a single character at a time, but still being able to swap between the three at the touch of a button. The main objective is to get to the end of the level by any means possible and there are several blue orbs scattered along the way. It can sometimes take a bit of thinking to figure out how to collect them since they aren’t always in your path. You might have to get creative and a little bit lucky sometimes to collect them all. You can also level up your characters with special unlockable abilities throughout the game and it adds just a tad bit of much appreciated customization and creativity. 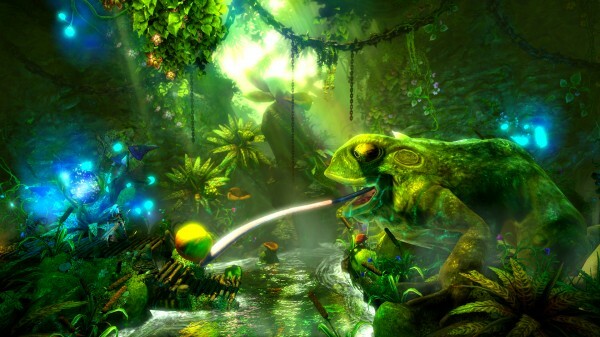 The beauty in Trine 2’s gameplay lies in the fact that you are never forced to switch characters if you choose not to. You can complete a level by playing through simply as one of the three provided and there is even a ‘chievo associated with it. However, in order to collect orbs and solve some puzzles, it is always helpful to swap characters to complete the task at hand (i.e switching to Amadeus when you need to move objects and then to Pontius as enemies are approaching). Another great feature that Trine 2 offers and one that I found completely changes the way you play the game is co-op, available in both offline & online versions. Now when you and your buddies (max. 3 people including you) play a co-op session, it is no longer a solitary character on the screen, instead it is now 2-3 people working together as a team to solve puzzles and defeat the baddies. The game takes on a whole new meaning and although some may say it gets easier, I found it to be much more fun and I personally had a blast playing the story in co-op mode. It is almost like you’re playing something quite different and you enjoy the game much more when you do so. There is also an “unlimited” mode. When you play this in co-op, it gives you and your buddies the ability to be the same type of characters if you so wish to do so. That means you can all play as three wizards, knights or thieves. It definitely does take the challenge out of the game but it is a really welcome addition! 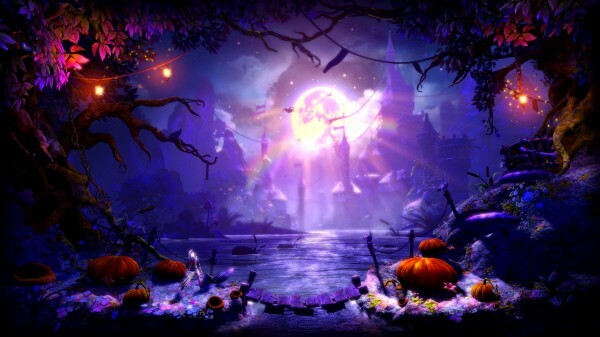 As you have noticed me saying, the visuals in Trine 2 are simply tear inducing. The great attention to detail is like none other I’ve witnessed on the XBLA marketplace. Next, let us move onto the audio of Trine 2. Right as you tear into the game, you realize that the soothing audio crafted by Ari Pulkkinen meshes together wonderfully with the game. There is a wide variety of music to go around and with over an hour’s worth of it, the Trine 2 Soundtrack is a great listen all by itself. I picked this up shortly after I began playing the game! Not only is the music in the game well done, but so is the voice overs for the characters. There is almost always friendly banter going around and the character’s each have their own personalities, and it shows. Apart from all the great things that Frozenbyte offers us with Trine 2, there are however some oddities that must be pointed out. Since the game is physics-based, you are bound to come across some minor bugs here and there. For example: I was playing a co-op session and we were underwater. There was a massive clam sitting by a wall with its mouth shut. Our wizard opened the mouth and right before he did so, our thief got stuck behind the upper jaw of the clam and the rock surface against which it was resting. He was essentially stuck from here on after since our wizard died shortly after. The thief basically drowned to death since there was nothing that could be done. This may not be so much as a bug as a minor annoyance and one of the features which you just have to live with. However, that is not all. One of the other major bugs (or perhaps a blessing!) I experienced was when I was still early on in the single player storyline and in order to check out co-op, I hopped into a random session. This one was much further on in the story and since the players had better unlocks they were better suited to complete some achievement related actions. This is exactly what happened and one of my co-op buddies performed something to pop an achievment and it unlocked for me as well! I felt rather ticked off at the time since I didn’t have the privilege to unlock the ‘chievo myself but stuff like this may be of use to others. I’m not too sure if this is a glitch/bug but it surely is out of the norm and should be noted. 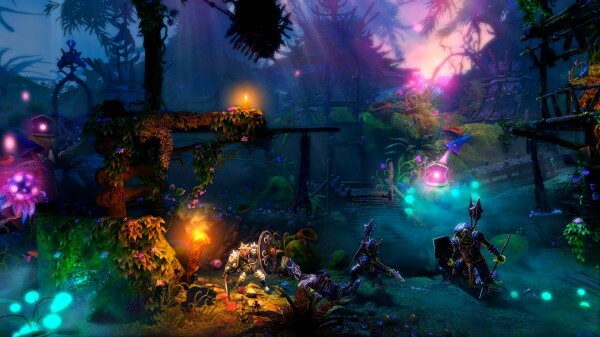 All in all, Trine 2 is a fantastic addition to the XBLA marketplace and Frozenbyte has developed another addition to my top-tier games of 2011. A big kudos to the team and for all of you folks out there, this game is a must buy! You’ll be getting more than your money’s worth out of it for just $15! I’ve just run through the pictures to get a feel for what the game is like and already I want to play! First I’d better actually read the review though. I’ve just played the demo I I loved it! I’ve now got a growing list of XBLA games I have to get! This graphics on this game are incredible.